The oceans, the big blue, source of life, the hallmark of Earth. We hold the oceans within us, both physically and mentally. Vast, blue, tranquil, and treacherous, the oceans are the signature of our planet. The only planet in the solar system blessed with a liquid medium for life to evolve in. The motions of the atmosphere, traced out by clouds, and the size of the oceans dominate the view of earth from space. 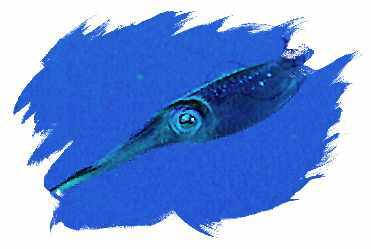 So vast are the oceans, in fact, that they take up almost 71% of the entire surface of the globe (139 million square miles). The oceans have an average depth of 12,230 feet (3730 m) and reach the deepest point in the Mariana Trench of the northwester Pacific Ocean, at 36,204 feet (11,038m) below sea level. The ocean basins hold at vast quantity of water, over 285 million cubic miles of water (1185 million cu. km.). This vast quantity of water arose from the Earth's interior as it cooled. The oceans are the largest repository of organisms on the planet, with representatives from all phylum's. Life is extremely abundant in the sea, from the obvious large whales, fish, corals, shrimp, krill and seaweed, to the microscopic bacteria floating freely in the seas. The bacteria is so abundant that just one spoonful of ocean water contains from 100 - 1,000,000 bacteria cells per cubic centimeter! The oceans contain the largest repository of organisms on the planet, and all the organisms in the ocean are subject to the properties of the seawater surrounding them. Water surrounds all marine organisms, composes the greater bulk of their bodies, and is the medium by which various chemical reactions take place, both inside and outside of their bodies. In this chapter, we present the basic chemistry of water, a necessary step in understanding the interesting roles water plays as an extremely suitable medium for life. Important interactions occur because of the electron sharing. The oxygen atoms tends to draw the electrons furnished by the Hydrogen atoms closer to its nucleus, creating an electrical separation and a polar molecule. 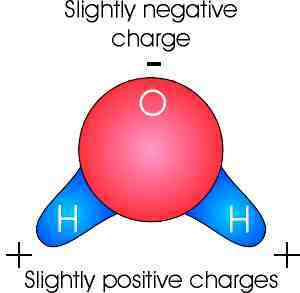 The polar nature results in the hydrogen end (which ahs a positive charge) attracting the oxygen end (with a negative charge) of other adjacent water molecules. 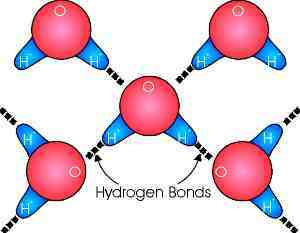 This forms Hydrogen Bonds between adjacent water molecules. These bonds are weak compared to the electron sharing bonds (6% as strong) and are easily broken and reformed. The hydrogen bonding and polarity of water molecules is responsible for many of the unique characteristics and physical properties of water. If water was not polar, it would be a gas at room temperature and have an extremely low freezing point, making life impossible. At the air-water interface, the sticky polar nature of water allows it to form a 'skin' over the water surface, strong enough to support small objects. This phenomenon is known as surface tension, and water has the highest surface tension of all common liquids. Water has a great capacity to hold heat energy, with the highest heat of vaporization of most common substances (thus a high boiling point--allowing it to be liquid on the surface of the relatively warm Earth). When water evaporates, it absorbs considerable amounts of heat. Water has a high latent heat of fusion; when ice is formed, considerable amounts of heat energy is released. Water therefore acts as a buffer against temperature changes and keeps the earths climate from rapidly fluctuating. Possibly most important for the chemical processes of life-- water is a universal solvent. It has the ability to dissolve more substances than any other liquid (due, once again, to its polar characteristics and hydrogen bonding). When dissolved in water, salts turn into their ions (Sodium chloride, table salt, NaCl becomes Na+ and Cl--.) This allows for many free radicals to be available to the chemistry of life. Water absorbs light differentially. 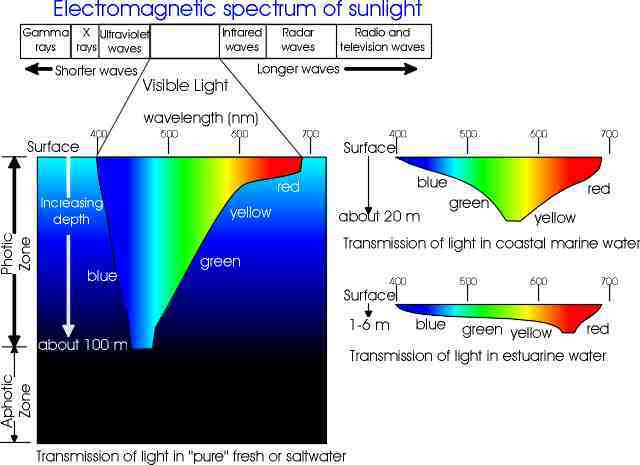 The red end of the light spectrum is absorbed in shallow water while the blues and greens penetrate the deepest (important for plants because different plants use different parts of the light spectrum for photosynthesis, and the differential absorption can determine the vertical distribution of marine plants). Seawater is pure water plus dissolved solids and gases. The dissolved solids come from 'weathering' processes of the continental land masses rocks being dissolved by rain water and flowing out to sea with the rivers. The gases come from the atmosphere. As water is a universal solvent, many different compounds are dissolved in it. A 1kg sample of saltwater contains 35 g of dissolved compounds, including inorganic salts, organic compounds from living organisms, and dissolved gasses. The solid substances are known as 'salts' and their total amount in the water is referred to by a term known as Salinity (expressed as parts per thousand). Oceanic salinities generally range from 34 to 37 parts per thousand. Variations from place to place are due to factors such as rainfall, evaporation, biological activity and radioactive decay. Salinities are higher in the tropics due to high evaporation rates. Fresh supplies of salts are now being added to the oceans from the rivers at roughly the same rate that they are being removed by various physical, chemical and biological processes. These percentages remain constant regardless of the waters salinity; therefore, salinity can be measured by measuring just the concentration of one of the salts, such as chlorine. The remaining .72% of the 'salts' are inorganic salts crucial to life. These include phosphates, nitrates, (both nutrients required for photosynthesis) and silicon dioxide (required by diatoms to construct their glass skeletons). In contrast to the other salts, the nitrates and phosphates vary in concentration due to biological activity. In surface waters, where plants are actively in the process of photosynthesis, the nitrates and phosphates can be in short supply, limiting the amount of biological activity that can take place. Temperature is a very important physical parameter in the marine environment. It limits the distribution and ranges of ocean life by affecting the density, salinity, and concentration of dissolved gasses in the oceans, as well as influencing the metabolic rates and reproductive cycles of marine organisms. The seasonal range of temperature in the ocean is affected by latitude , depth, and proximity to the shore. Marine temperatures change gradually because of the heat capacity of water. In the abyssal zone, water temperatures are remarkably stable and remain virtually constant throughout the year. Similarly, in equatorial and polar marine regions, ocean temperatures change very little with season. Because the surface of the ocean is heated by sunlight, the depths are cooler. There is a minimum of vertical mixing, because the warm water cannot displace the dense, colder deep water. The waters of the ocean are in constant motion. Its movement ranges from strong currents such as the Gulf Stream, down to small swirls or eddies. What causes all of this motion? The short answer is: energy from the Sun, and the rotation of the Earth. Circulation of the atmosphere--this is, winds. Energy is transferred from atmospheric winds to the upper layers of the ocean through frictional coupling between the ocean and the atmosphere at the sea-surface. Causing variations in the temperature and salinity of seawater, which in turn control its density. Changes in salinity are brought about by the addition or removal of freshwater (mainly through evaporation and precipitation, but also, in polar regions, by the freezing and melting of ice. If surface water becomes more dense than underlying waters, an unstable situation develops and the denser surface water will sink. This vertical, density-driven circulation is known as thermohaline circulation. The frictional coupling between the oceans waters and the solid Earth is very weak. The same is true for air masses. Only very close to the surface of the Earth is frictional coupling significant. In the extreme case of a projectile moving above the surface of the Earth, the frictional coupling is effectively zero. The Earth rotates at a constant rate. Consider the following: A missile fired due northwards from a launch pad at the equator. When it leaves the launch pad, the missile is moving eastwards at the same velocity as the Earth's surface, as well as moving northwards at its firing velocity. however, as the eastward velocity at the surface of the earth is greatest at the Equator and decreases towards the poles, as the missile travels north, the eastward velocity of the Earth below the missile becomes less and less. As a result, in relation to the Earth, the missile is moving not only northwards but also eastwards, at a progressively greater rate. The apparent deflection of objects which move over the surface of the Earth without being frictionally bounds to it (such as missiles, or water and air), is explained in terms of an apparent force known as the Coriolis force. A missile launched from the Equator has both its northerly firing velocity and an eastward velocity relative to the surface of the Earth at the equator. Its actual relative travel follows a resultant vector which is a combination of the two. The path taken by a missile has a deflection attributed to the Coriolis force. The coriolis force increases with increasing latitude. The blue paths shown indicate the courses taken by a missile or any other body moving over the surface of the Earth without being strongly bound by friction. The Coriolis force acts at right angles to the direction of motion, so as to cause a deflection to the right in the Northern Hemisphere and to the left in the Southern Hemisphere. Because a missile is moving so fast, the amount that the Earth has 'turned beneath" it during its short flight is small. Winds and ocean currents, on the other hand, are slow moving, and so are significantly affected by the Coriolis force. Consider an ocean current flowing at 1 knot at 45 degrees north latitude. The mater will travel about 1800 meters in an hour, and during that hour the Coriolis force will have deflected it about 300m from its original path! The Coriolis force therefore has a significant effect on deflecting ocean currents. Odyssey Expeditions Tropical Marine Biology Voyages offers educational adventure programs for high school and college students aboard sailing catamarans in the British Virgin Islands and Windward Islands (St. Lucia, St. Vincent and the Grenadines, Grenada). Learn about marine biology, coral reefs, turtles, sharks, fishes, ecology and take part in hands-on research projects and underwater environmental service progrects plus earn school credit. No experience is necessary, learn Sailing, PADI SCUBA diving, Seamanship, and explore the islands hiking, climbing, scuba diving. Coed programs available for students ages 13-22. Voyages are 3 and 6 weeks long in June, July, and August. Tuition starting at $5190 all inclusive. Live-aboard a 46 foot sailing catamaran and Dive Dive Dive. Earn community service and academic credit. Study sharks, dolphins, turtles, corals, and fishes. Earn PADI SCUBA certifications including specialties and advanced. 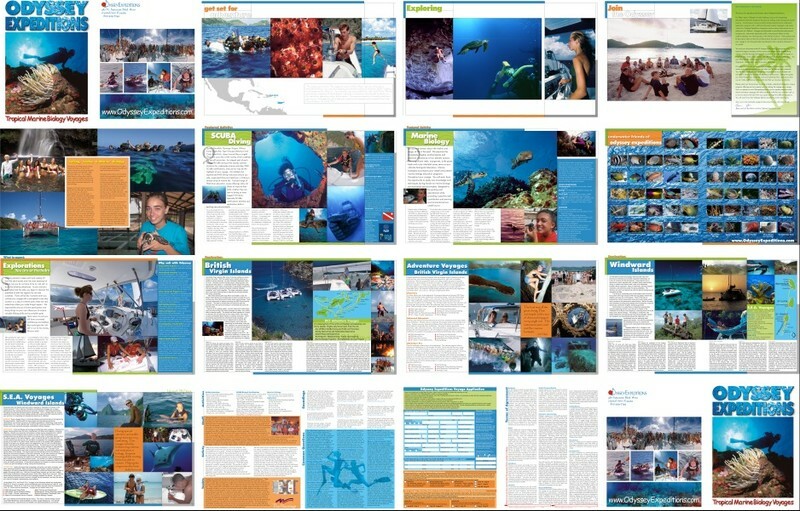 Learn digital underwater photography. For fun waterskii, wakeboard, sea kayak. How did you learn about Odyssey? Poster at school A friend told me about Odyssey My school teacher told me about Odyssey Search results page from Google, Bing, Yahoo etc. Would you like an Odyssey team member to call?